LG Electronics is all set to release one more top-class HD projector to the market. The latest model LG Electronics PH550 HD home theater projector is now available for Pre-order on Amazon and expected to reach the users soon. The model comes with improved specification at an affordable price tag. Its spec sheet and images reveal bundle of useful features with a superior build quality. Here is our LG Electronics PH550 Review to explore the projector’s complete specification, features set and to see where the model stands in competition. HD resolution of 1280×720 pixels. Wireless mirroring function to stream your smartphone screen on large screen. Wireless Bluetooth connectivity for sound output. Superior quality LED lamps with 550 Lumens that lasts for 30,000 hours. Built-in digital TV tuner. Built-in battery that lasts for 2.5 hours. 1x HDMI input. The latest model from electronics giant comes with few innovative features that include wireless connectivity, built-in TV tuner and battery. 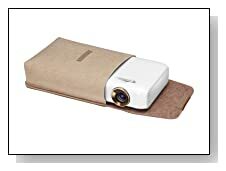 These features allows the users to plan their outdoor movie nights with much comfort, without messing with wires. The device is also very compact and easily carry wherever you go. Movies, media files, office documents and even YouTube videos from your smartphones can be streamed directly on big screen without need of any cables. The model also has built-in digital TV tuner to add a piece of pie to your entertainment. The battery that comes along with the PH550 lasts for 2.5 hours, enabling the users to watch a complete movie on a single charging. The device can pair with wireless Bluetooth enables speakers and headphones, which adds further flexibility to use the projector. The projector also has one HDMI input, 1x USB input, 1x AV input, and 1x RGB input ports to connect with conventional devices. LG Electronics is also assuring a long lasting LED lamp on this new product, expected to work for ten years if the device is used continuously used eight hours a day. Only downside we would like to mention, the device doesn’t come with a Full HD resolution. Nevertheless, 1280×720 pixel HD resolution is good enough for a 100” screen, as we have noticed in similar models. Overall, the LG Electronics PH550 HD projector has tons of useful features to stand out from the competition. 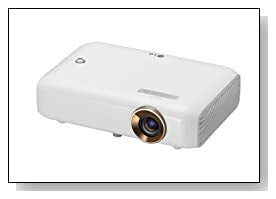 The model is best suited for someone looking for a decent home theater projector from reliable brand that gives highest flexibility.